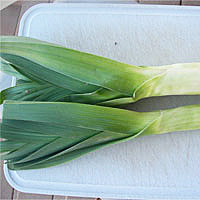 Leeks look like an oversized green onion but have a much milder flavor. I've been told (by the author of French Women Don't Get Fat), that leek broth is the miracle detox that all the American diet books are after. Drink it for a weekend and that croissant binge is water under the Seine, she says. I think the real miracle is the taste. This is a serious addiction in the making, and I'm not talking leftover Halloween candy. Regardless of her detox lure, I went for a heartier version than a simple broth. Leek soup, one with a plentitude of carrots, potatoes, and, yes, leeks, will have you dusting off your copy of French Kiss in no time, complete with a little fantasy moment where you live life in the rustic countryside with Kevin Kline turned French vineyard owner. In all reality though, my friend who actually is from the French countryside, tells me that leek soup was a family staple, and this recipe is based on her version. Thanks, Cindy, for bringing a bit of charm to my table. If you want to take this meal from rustic charm to a full spread, Ashley's roasted chicken with Leek Soup is also amazing. Slice 3 leeks into rings. Start with the white and cut about mid-way into the green. 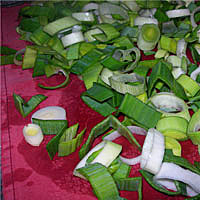 The tops of the leek get tougher and weaker in flavor, so I discard them. Leeks grow up through the dirt, so they need a thorough washing. 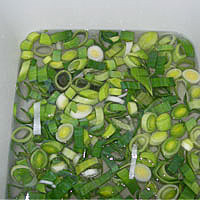 Fill your sink with a few inches of water and rinse the chopped leeks. Drain the water and fill it back up. Any remaining dirt will fall to the bottom, leaving the clean leeks floating on top. Spread the leeks out on a clean dish towel, and then roll it up and wring dry. This will get rid of any remaining water. Now that you have perfectly clean leeks prepped, chop the vegetables. Look at all that beautiful color! Don't worry, you're almost eating. 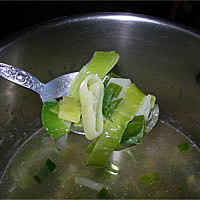 In a large stock pot, saute leeks in 5T butter until soft, 2-3 minutes. 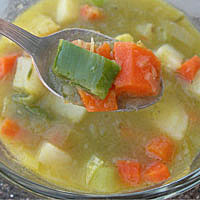 Don't skimp on the butter: this is a vegetable soup. You need a little fat somewhere in this meal! Next, sprinkle leeks with 1T flour and stir to combine. Add 5 1/4 C chicken broth and salt and pepper to taste. I recommend about 1 3/4 t salt and 1/4 t pepper. Reserve 1 C of the leeks and puree the remaining stock until smooth. 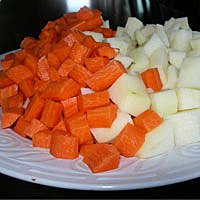 Add the vegetables and simmer until they are soft, about 10 minutes. 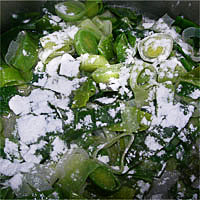 Add the reserved leeks back into the soup, adjust the salt, and serve. And remember, the leftovers will taste even better tomorrow. Problems: If you don't add enough butter or salt and pepper, instead of French countryside, you'll be thinking trash bin. Go ahead and add some butter, salt, and pepper at the end if it doesn't taste rich enough yet.